LED bulbs use about one-seventh less power (less cost to use) and has 10 times the lifespan of the halogen bulb. LEDs save money. They're more efficient. They last longer. Cast some spooky light on any dark castle dungeon or scary haunted house with mini Vulcan-inspired realistic flaming simulator fire lamps! Hanging from chains these silk lights provide an eerie ambiance to any mystic event or creepy indoor or covered outdoor space. This charming flame light looks great in any number of settings from bedrooms and dorm rooms to decks and patios. For Halloween, Luau, cosplay and rave parties, it can serve both as a decoration and intimate low light source. This hanging lamp comes with an AC power cord. Makes any room glow like a vampire lair or castle dungeon! Create your own mystical flame at home! Flame Light features a die-cut red fabric flames lit by red cool-running LED lights, set in a black plastic bowl suspended by metal chains. Flame fan runs on a 6-ft 110V cord and includes 2 Red LED bulbs, each consisting of 6-mini LEDs per bulb. Flame Light measures 4-inch tall x 8-inch diameter with attached 14-inch long chains. 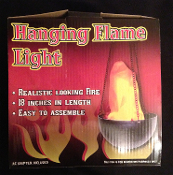 New Economy Hanging Flame Light Prop. Create an eerie Halloween scene by placing this hanging flame light in front of your Home, Window or your porch or in your yard. RED Silk fabrics, Red LED lights and a small fan create the illusion of a realistic fire. 110V USA voltage outlet plug. 18 inch long. Pot is suspended by chains with a metal hanger ring for easy display. New in box. Light up the night this Halloween with this LED Hanging Flame Light. Plug it in to make any room glow like a dungeon! Add a spooky touch to your Halloween scene or create an eerie ambiance in your Halloween haunted house! The silk ''flames'' are approximately 5-6-inches (12.5-15cm) high.